TAIPEI: An artist is planning to erect a statue of the Goddess of Democracy — one of the defining images of the 1989 Tiananmen Square protests — on a Taiwanese island in sight of mainland China. The 30-metre (99-foot) high statue would undoubtedly irk Beijing and whether the plan is allowed to go ahead is being seen as a key test of Ma Ying-jeou’s newly-re-elected China-friendly administration. New Zealand artist Chen Weiming plans to erect the statue on Kinmen, a fortified frontline island off China’s southeastern Xiamen city, and is raising funds for the project in the United States where he is based. “Kinmen is a place closest to the mainland... and the statue can easily be seen by many Chinese tourists travelling there,” Chen told the state Central News Agency. On the night of June 4, 1989, the Chinese military shot dead hundreds if not thousands of students and other pro-democracy protesters who had been demonstrating peacefully in Beijing’s Tiananmen Square. Tanks also crushed the Goddess of Democracy statue which students had built out of styrofoam and papier-mache and which had stood for five days in the square. REVIEW-JOURNALPosted: Jun. 2, 2008 | 10:00 p.m. Updated: Sep. 26, 2008 | 5:12 p.m.
Weiming Chen knew it would be tough to finish a 20-foot statue commemorating the Tiananmen Square protests in a month. But democracy and his native China are important to him, so he accepted the task. He at least knew he could work on it morning, noon and night, because he created the sculpture in the two-story foyer of his Las Vegas home. The "Statue of Democracy" was essentially done Friday, towering over the staircase in the middle of a makeshift scaffolding made of ladders and two-by-fours. The clay figure will serve as a mold for fiberglass pieces that will be assembled in Washington, D.C., on Wednesday, the anniversary of the massacre that ended seven weeks of pro-democracy demonstrations in 1989. "They wanted China to be a democratic country like the United States," said Chen, a sculptor who has lived in Las Vegas since August. "I made this for the memory of Tiananmen Square." The sculpture, which has elements in common with the Statue of Liberty, is a tribute to a rough plaster statue that demonstrators built in Tiananmen Square. A tank destroyed it. 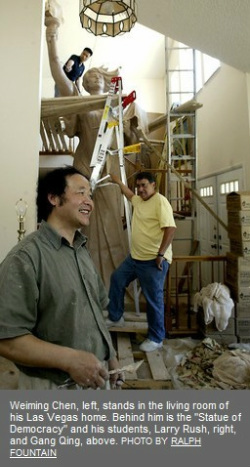 Chen left China a few months before the demonstrations and went to New Zealand, where he spent 18 years sculpting. His works include a statue of Sir Edmund Hillary, the first to peak Mount Everest, and a bust of the Dalai Lama. Chen left behind a good job planning sculptures for public spaces, but he wanted to be "more free." That's what he wants for his country as well. He's got a gift planned for when that happens: a 200-foot version of his sculpture that would be placed in Tiananmen Square. "Once the Chinese become a free country, I'm prepared," Chen said, adding, "I'll have to have a big studio. Not a house." Chen took the assignment from Yang Jianli, who was at the 1989 protests and has gone on to become a prominent activist and chairman of the Foundation for China in the 21st Century. Jianli is walking 500 miles from Boston to Washington, D.C., to raise awareness of the anniversary. Chen's trip is longer, but at least he's going by car. After unveiling the statue on Wednesday he hopes to find a permanent home for it in New York or Los Angeles. His affiliation with Jianli and his pro-democracy stance mean that he probably can't return to China until major changes take place. That may take a while, but he's optimistic: "The Chinese people are very patient." Contact reporter Alan Choate at achoate @reviewjournal.com or 702-229-6435 . Hong Kong's Goddess of Democracy was inspired by the original 10-metre tall Goddess of Democracy erected by the Chinese pro-democracy movement in Tiananmen Square during May–June 1989. Three successive political controversies surrounded the 6.4-metre bronze replica sculpted by Chen Weiming in 2010 in the backdrop to the twenty-first anniversary of the suppression of the Tiananmen pro-democracy movement – firstly, it was seized by the Hong Kong police at a street rally at the public open space in Times Square, Causeway Bay on the grounds that the display violated safety regulations; secondly, the sculptor, who came to Hong Kong to examine the sculpture for possible damage whilst in police custody, was denied entry into Hong Kong on 2 June. Thirdly, the erection of the statue on the campus of the Chinese University of Hong Kong (CUHK) was denied by university authorities, to the ire of the student leadership. The various controversies surrounding the statue reportedly increased the number of people attending the annual 4 June vigil in Hong Kong to historical highs. Since the record turnout for the anniversary vigil, and under pressure from students, the university authorities acquiesced in allowing the statue a 'temporary home'. 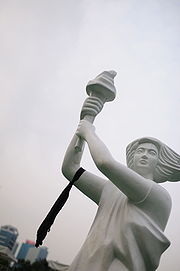 The original Goddess of Democracy statue has become an icon of liberty and a symbol of the free speech and democracy movements. The Chinese government has tried to distance itself from any discussions about the original statue or about the Tiananmen Square protests, and in the case of the Victims of Communism Memorial it called the building of a replica an "attempt to defame China." Several replicas of the statue have been erected worldwide to commemorate the events of 1989. As no discussion about or mention of the 1989 protests is tolerated in mainland China, and because China has publicly embraced the one country, two systems model of governance for Hong Kong, the annual 4 June observance – a tradition since 1989 – has continued after the transfer of sovereignty from Britain to China. Also, this 6.4-metre statue sculpted by US-resident Chen Weiming is the only 'Goddess of Democracy' to find a home on Chinese soil. The statue was sculpted of an imitated copper material, has been exhibited in the front of the United States Congress in the American capital after its completion in 2008. Another work of the sculptor, a relief measuring 6.4 m wide by 3.2 m high entitled Tiananmen Massacre completed in June 2009, joined the statue in Hong Kong in 2010. 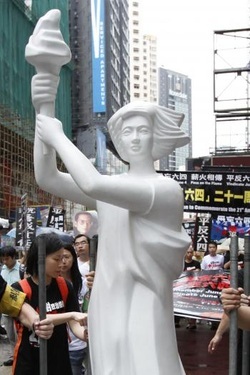 On 29 May 2010, Hong Kong police seized a statue and a six-metre-long relief – named 天安門大屠殺 (Tiananmen Massacre) – the Hong Kong Alliance in Support of Patriotic Democratic Movements in China (the Alliance) erected in Times Square ahead of the 21st anniversary of 6 June Tiananmen Square protest; organisers were arrested for lacking a license to organise "public entertainment". A second statue was erected following the anniversary march to commemorate 4 June pro-democracy movement, but was also seized by police citing the same Places of Public Entertainment Ordinance. Thirteen people who had been standing guard over the statue were arrested by police. Both statues were replicas of the 1989 Tiananmen Square statue – one statue was 6.4-metre bronze and the other a 2.2 m rendering in white plastic. The seizures were controversial. Although the management of Times Square said it preferred activities without political elements, it had not complained before police intervened. The police force said it was not responsible for enforcing the public entertainment law, so it had no statistics concerning it; the Food and Environmental Hygiene Department said only seven prosecutions had been made under the law since the beginning of last year. A government spokesman said that the art pieces would be returned "under condition that the police's relevant requirements will be followed." The Leisure and Cultural Services Department stipulated insurance and approval from registered engineers to guarantee that any object taller than 1.7 metres used on 4 June met safety standards. Activists refused the pre-conditions, and Alliance Deputy Chairman Lee Cheuk-yan threatened that North Point police station, where the pieces were being held, would be surrounded at 6 pm on 3 June by citizens demanding their release. After the statues and activists were hauled away, the Alliance displayed a 4.5-metre painting of the Goddess of Democracy in Times Square; several activists dressed like the statue. Apple Daily reported that similar observances with props were held at Times Square the previous year, and passed without police harassment. The police said that they had acted on a request from the Environment Department on 29 May; the Home Affairs Bureau said it was not notified ahead of the action. After several hours of negotiations with leaders of the Alliance, Police released the statues on 1 June notwithstanding activists' refusal to undertake not to display the statues within the vicinity of Times Square again. The police released it as 'a goodwill gesture', saying that they understood the organisers' need to have the statue set up for the vigil in the evening of 4 June; Loyalist former President of LegCo, Rita Fan, citing legal experts, said the unprecedented action of the police was improper. However, Police defended their action, saying the force had handled the situation, including the return of the art pieces, in a "lawful, reasonable, and sensible manner". Civil rights groups and Pan-democrats reacted angrily to the seizure, warning that freedom of expression was under threat; Chinese Human Rights Defenders called the government actions "an unprecedented act of interference with the territory’s commemorative activities." Public anger over the seizures, and fears of political repression, were widely cited as a direct cause for the record 150,000 participants (or 113,000 according to the police) to attend 4 June vigil. Political commentator Michael Chugani said that the police's reason for seizing two replica Goddess of Democracy statues was unconvincing, and that the public had a right to know from how far up the command chain the heavy-handed order came. He said that this challenge to free expression in Hong Kong should not be conflated with the Tiananmen issue. The LegCo Food Safety and Environmental Health Committee of LegCo called an extraordinary meeting for 21 June, the FEHD and the Home Affairs Bureau were asked to be present to account for their actions, their reasons, and the identity of the chief decision-maker for the confiscations.Although health minister York Chow said the Food and Environmental Hygiene Department had "received information" from an undisclosed source that people were breaking the law in Times Square, departmental director, Cheuk Wing-hing, reported to the LegCo panel that he had given the order, acting on news reports. Upon hearing that his works had been seized by police, the sculptor decided to go to Hong Kong on his own initiative to seek an explanation from the government, and to examine the sculpture for possible damage whilst in police custody; he boarded a plane from Los Angeles on 31 May, but was refused entry into Hong Kong. Chen, who has visited Hong Kong twice before, had arrived at the airport on the night of 1 June. Democratic Party legislator James To acted as Chen's lawyer during his two-hour interrogation by the authorities. To said Immigration officials questioned Chen about his visit, and summarily deported him for refusing to sign a document saying he agreed to leave. Although Immigration officers told To during the interrogation that "no decision had been made," To said he was informed 15 minutes after leaving (at 3 am) that Chen would be repatriated. To said that Chen was hurriedly put on a plane before an appeal could be launched: "I requested the legal [expulsion] order to be faxed from the immigration office [so that I could respond]. Before I received the document at 9.50 am, I was told at 9.40 am Chen was on the plane." James To decried the "dirty tricks" employed, and said that people were very annoyed that Hong Kong was denying "a very humble sculptor" entry for political reasons. Chen said the Hong Kong government's denial of his entry was an edict of the central government in Beijing. He continued: "The confiscation of my statue was due to the sensitivity of history that happened 21 years ago, which was reflected in my sculpture." Chen's wife said that her husband had gone to Hong Kong to get an explanation from the government, and admitted that he considered he was testing to see if the Hong Kong Basic Law was still being upheld, and said she was disappointed that Hong Kong had changed so much in just 13 years. The immigration department issued a statement saying it would not comment on individual cases, and that it "handles all entry applications in accordance with the law and prevailing policies and having due regard to individual circumstances". Secretary for Security Ambrose Lee denied that the government had a blacklist: "The Immigration Department works in accordance with established policies and laws of Hong Kong. It has to take into account the interests of Hong Kong when deciding who can come and who cannot come. The administrative and planning committee of the Chinese University of Hong Kong convened an emergency meeting for 1 June after receiving an application from the CUHK student union on 29 May to permanently locate a statue on campus. The meeting was chaired by incumbent vice chancellor Lawrence Lau. The next day, the university announced its decision not to grant the request; the University said it should not align itself with the actions or activities of a political nature that may compromise its political neutrality. However, students were prepared for a stand-off against the University, saying they would ensure the statues were accommodated on campus "at all costs". University’s staff and students' unions accused the committee of self-censorship. The staff union said: "As an institution of higher learning dedicated to the pursuit of knowledge and truth, the Chinese University should maintain so-called ‘neutrality’ by facing historical facts bravely". Student union president Eric Lai also accused the administration of hypocrisy, citing that university president Lawrence Lau lacked neutrality because he served on advisory bodies for the Hong Kong and central governments. Lai told a crowd of 2,000 people that the university officials should apologise for their opposition of the art display. On 4 June, backed by storms of protest, the university capitulated to the students' demands for the statue to be allowed on campus. The Alliance organised a transport truck and the delivery was escorted by police forces. The students themselves then raised it on campus.Vice-chancellor designate Joseph Sung, who was out of town, but was consulted on the vote, admitted that it was the biggest political storm in 21 years. He said he was opposed to invoking political neutrality as the reason for refusal, and that others shared that view. He added that the management team was "immature" and "inexperienced" in handling the incident, and pledged improved communication and dialogue with students on the future of the statue when he takes up the post next month. An editorial in The Standard criticized the board's naivety in not anticipating the reaction from students and politicians. It was also highly critical that Sung had sought to distance himself from the decision with such a "lame excuse". Following Sung's remarks, outgoing vice-chancellor Lawrence Lau defended the committee's decision as "collective and unanimous", seemingly at odds with Sung's assertion the previous day that there were dissenting voices to the ban. He also disagreed with Sung's view that the decision taken was 'immature and inexperienced', as the matter had received 'detailed consideration'. The University attempted to soften the rift at the top with a statement from Sung that he acknowledged and agreed with the stance in the statement of rejecting the application, issued on 2 June but only "had different views on the wording." Apple Daily commented that the disquiet among board members over Sung's comments forced a hasty retraction; it suggested his lack of management's support, the result of internal politics and the power base cultivated by Lau, did not bode well for his authority. The students union pointed out to inconsistencies in the respective accounts of Lau and Sung, and said the two professors should have communicated to reach a consensus; Lau's reply "failed to explain why the school used political neutrality as a reason to reject the statue." The union said it had requested a meeting with the dean of students on Monday to seek talks with the governance team, but the request was rejected as the team had to deal with the public relations matters. Hong Kong authorities have denied entry to the creator of the statue dedicated to the victims of the June 4 Tiananmen Square Massacre in 1989. Chen Weiming, the sculptor who created the “Goddess of Democracy” statue, arrived at the Hong Kong Airport at 11 p.m. on June 1. After being identified by immigration officials, he was immediately deported back to the United States on early June 2. Prior to his deportation, Chen made a statement in which he criticized Hong Kong’s “one country, two systems” arrangement [with China] as “deceiving” and complained that Hong Kong authorities had confiscated two of his “Goddess of Democracy” statues, using traffic obstruction and a drug search as excuses. He said the reason behind the authorities’ actions is that the artwork has provoked some particular individuals’ nerves. After Chen was deported, Hon. To accused the authorities of delaying his appeal on behalf of Chen to higher officials. To waited for more than two hours at the airport, but the immigration officials did not give a clear answer whether or not Chen’s entry was granted. Yet as soon as To left, immigration officials moved to immediately deny Chen’s entry. Hon. To said that in order to appeal for Chen, he had requested a hard copy of the deportation order by 8 a.m. on June 2. But the Immigration Department did not fax the order until 9:50 a.m., and the quality of the fax was so poor and dark that it was not readable. By the time another fax arrived at 11 a.m., Chen had already been deported. Mr. To criticized what he described as “despicable means” taken by the authorities and said he would discuss with Chen about filing an appeal after Chen has returned to the United States. To said that Chen only wanted to participate in the June 4 Memorial in Hong Kong and repair the statue if necessary. Chen had no problem entering Hong Kong three years ago, but was rejected entry this time on the eve of the June 4 Memorial. Hon. To questioned the motives of the Hong Kong government for not granting entry to a sculptor. Yesterday was the 21st anniversary of the Tiananmen Square incident. Up to 150,000 people gathered in Hong Kong’s Victoria Park (維多利亞公園) last night for the annual candlelight vigil, dedicated to remembering the courage of those involved in the student uprising at Beijing’s Tiananmen Square (天安門廣場) on 4 June 1989. This record attendance comes amidst increasing agitation within the former British colony towards Beijing as people feel an increased scrutiny from the government. Campaigners are also resenting the increased interference Beijing is showing in the democratic movement in Hong Kong. It has been a week of controversy in Hong Kong. Thirteen protesters were arrested on 29 May 2010 in Times Square after clashing with police when protecting their 6.4 metre tall bronze Goddess of Democracy statue and a 6.4 metre wide carving depicting the Tiananmen Square massacre (天安門屠殺浮雕) from being seized. The pieces of art were eventually seized by police but police agreed to “free” (release) the works on 1 June 2010 as an act of goodwill after negotiations with the Hong Kong Alliance in Support of Patriotic Democratic Movements of China. The Chinese-born now American sculptor that created the art works, Chen Weiming (陳維明), was refused entry into Hong Kong on 2 June 2010. At the airport, he was stopped by Hong Kong immigration officials and sent back to the United States after he flew into the territory to check the sculpture for damage. He was quoted to have said 「香港不是法治地區嗎？」(“Is Hong Kong not a place of law?”). He graduated from Beijing’s Central Academy of Craft Art (中央工藝美術學院). On 30 May 2010, a smaller version of the bronze statue made from a plastic-like material was used in a protest in the city. It was also seized by police when it was left to stand outside a shopping centre. 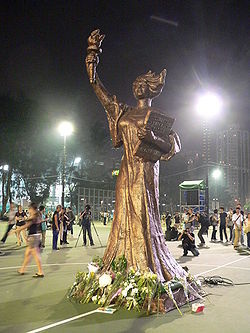 On 2 June 2010, the Chinese University of Hong Kong (CUHK) banned its students from erecting the Goddess of Democracy statue within the campus confines citing the need to maintain political neutrality. It was immediately labelled the “Chinese” university of Hong Kong (中[國]大[學]), with students accusing the university of being pro-Chinese. The CUHK student union went into negotiations with university officials and despite not achieving consensus, the statue was brought in. 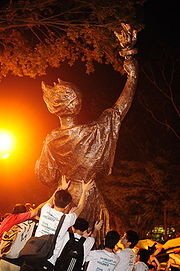 The union was able to erect the statue on campus on 5 June 2010, hours after the candlelight vigil at Victoria Park. Close to a thousand teachers, students and media crammed onto the Hong Kong MTR from Causeway Bay station (銅鑼灣站) to CUHK to welcome the statues’ appearance. Now discussions centre upon the future of the art works in CUHK. The bronze Goddess of Democracy statue was erected in Victoria Park for the candlelight vigil on 4 June 2010 immediately after its release from police custody on 1 June 2010. It was displayed proudly during the candlelight vigil before being relocated to CUHK. Members of the public left flowers at its base as respect to those fallen twenty-one years ago. The new statue was meant to replicate the 10 metre foam and papier-mâché original created by university art students on 30 May 1989. At the time it was the symbol of the student’s struggle for democracy in Tiananmen Square (below). The original Goddess of Democracy only stood for five days before it was toppled by tanks as the People’s Liberation Army cracked down on the 300,000 protesters on the morning of 4 June 1989.